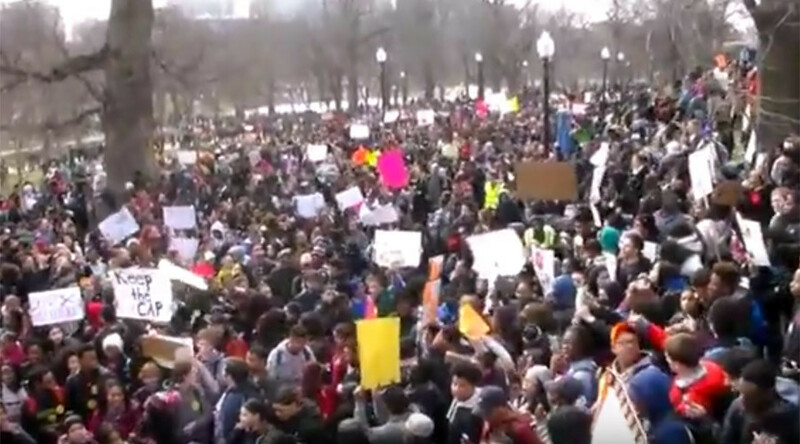 Classrooms in the Boston Public Schools system were a little quieter on Monday as over 1,000 students ditched school for a raucous protest against education budget cuts. The mostly peaceful march through downtown was eventually dispersed by police. "Don't cut our future" read one of the many signs hoisted above a packed and youthful crowd walking from Boston Common to the State House to City Hall and on to Faneuil Hall Marketplace, where megaphones carried similar messages. Specifically named by some protesters was the city’s mayor, Martin Walsh, who they see as not generous enough with school funding. Walsh, however, told The Globe that budget negotiations were still fluid and that estimates of a $50 million deficit were way over his more realistic figure of $30 million. The budget for next year is actually a record breaker, totaling over $1 billion for the second consecutive year. Saying that many of the protesters had been “given false information,” Walsh recommended finding extra money for classrooms by taking from schools’ administrations, transportation, and food services, as well as the district’s central office. Another promoter of the event, the Alliance to Reclaim Our Schools, told The Globe that the Boston protest was just one example of actions taken nationwide against education cuts. While no arrests were made, “scuffles” were reported at Downtown Crossing after the protest officially ended, and many were hesitant to disperse after police orders were given, according to The Globe.